The 2001 German film Mostly Martha is a heart-felt, funny, and romantic piece powered by the wonderful actress, Martina Gedeck (The Lives of Others). The winner of numerous awards, its success could mean only one thing: an American remake. 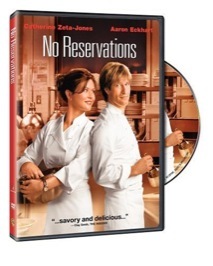 Six years later, the film is upon us in the form of No Reservations, a truly Americanized version of the original. This is pure Hollywood, now a vehicle for Catherine Zeta-Jones and co-starring Aaron Eckhart (Thank You For Smoking). Kate (Zeta-Jones) is the head chef at a high-class restaurant in Manhattan who is very particular about not only her food, but about every aspect of her life as well. Her world is turned upside down when her sister dies in a car accident, leaving Kate to care for her niece, Zoe (Abigail Breslin). While Kate is taking a few days to get settled with her new roommate, the restaurant�s owner, Paula (Patricia Clarkson) goes behind her back and hires a new chef named Nick (Eckhart), whose abrasive personality might be just what Kate needs to get past the curveball that life has thrown her. The story, themes, and tone are very similar to the original, but, things have just been too �Hollywoodized� for the film�s own good. One of the problems is in the casting, in that the original benefited, at least for American audiences, by our ability to relate to Gedeck, who gives an amazing performance. This time, it�s difficult to believe in Kate�s plight because Zeta-Jones doesn�t quite immerse herself in the character. Eckhart is fine, but, despite his second-billing stats, he isn�t really allowed to let loose. This is more than likely a limitation of the script, but Sergio Castellitto did a nicer job in Mostly Martha, and had much better chemistry with Gedeck. Breslin continues to act older than her age, but at times, she is a little too whiny and weepy, even for this material. The soundtrack is one of the more annoying selections of music I�ve heard in quite a while. Whether it�s Philip Glass� repetitive score or a musical montage featuring the worst rendition of The Lion Sleeps Tonight ever recorded, the tunes are a major distraction here. Still, this is an easy watch that is perfectly suited for the whole family. Sure, it�s another one of those movies where an adult, who can barely take care of herself, is thrust into having to care for a child, but it�s refreshing in that there�s none of the ridiculous goofiness and sight gags that such fare (The Game Plan) usually relies on. Don�t watch this on an empty stomach, unless you�re willing to run out to a fine dining establishment in the middle of it. The food here looks fantastic, and is the focus of many shots, resulting in an instant desire to indulge in a nice steak or lobster. I haven�t been this turned onto food during a movie since seeing Big Night. This is a perfect �date movie,� especially if you�re still feeling-out your significant other�s taste in films. The only stipulation is that you better be prepared, food-wise, before you sit down and indulge. Image Transfer Review: We�re given the option of both a 2.35:1 anamorphic widescreen presentation and a full frame one. Both transfers suffer from some compression issues that leave some softness hanging around, but, otherwise, the excellent cinematography is allowed to shine. The colors are consistently bright and vivid, while dirt and grain are kept to a bare minimum. Audio Transfer Review: The Dolby Digital 5.1 track only utilizes the surrounds to accommodate the music, but the overall mix is perfectly suited for the material. Sound effects and ambient sounds blend in nicely with the crystal clear dialogue, which also sounds just fine. UnWrapped � Episode of the Food Network series. Extras Review: Aside from some previews for other Warner releases, the only extra on board is an episode of UnWrapped. This 21-minute installment of the Food Network show takes host Marc Summers to the set of No Reservations, where he sits down with Zeta-Jones and Eckhart, who take us through the process of working on the film, and making its food. It�s not as endearing as its German parent, but 2007�s No Reservations is still one of the better romantic comedies of the year. Though it overdoes the genre�s conventions at times, there�s still enough here for the whole family to enjoy. Warner�s disc does a nice job with the audio and video presentations, but there�s only one extra feature to speak of.